The hissing sound you hear in the background when you turn up the volume of your music player is called “noise”. Most of this hiss is due to the thermal motion of electrons in the music-player circuitry. Just like molecules in a hot gas, electrons in the circuitry are constantly jiggling about in a random fashion, and this motion this gives rise to an unwanted noise signal. But there is another type of noise that only comes into play when we have an electrical current flowing. This noise is known as shot noise . Obstacles that generate shot noise in this way are found in many electronic components, such as diodes and some transistors, and electronic engineers take great efforts to try to get rid of the effects of all sources of noise, including shot noise, in their designs. Now a new study has shown that shot noise can be eliminated at its microscopic origin. And to do so, they have borrowed an idea from an unlikely source – the early days of the steam engine. Shot noise has its origins in the fact that electrical current is composed of a stream of individual particles – electrons – and that the behaviour of these particles is governed by the strange laws of quantum mechanics . When an electron encounters an obstacle that you’d think would block its path, quantum mechanics offers the possibility that it can pass through it unhindered. This is called quantum tunnelling, and it makes the seemingly impossible possible. 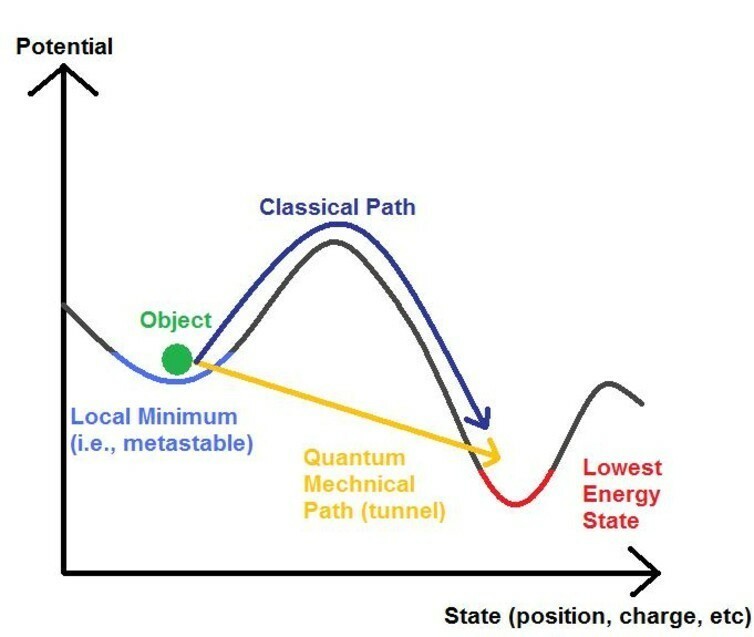 The important thing about quantum tunnelling is that it is a random process — quantum mechanics can tell us with what probability an electron might tunnel, but it can’t tell us whether any particular electron will tunnel or not. Thus, if a stream of electrons hits an obstacle, some will tunnel and some will not, and this happens in a completely random fashion. If we could listen to the arrival of a stream of electrons tunnelling in this way, it would sound something like the random pitter-patter of raindrops on a flat roof. It is this randomness, as compared with the regimented drip-drip-drip of a tap, that makes up shot noise. In the 18th century, James Watt was struggling to get his steam engine to run at a constant speed. To solve this problem, he came up with the “ centrifugal governor ” in 1788, a contraption that consisted of two metal balls rotating on a vertical spindle driven by the steam engine. If the engine ran too fast, the balls would move upwards under the centrifugal force (a force acting on a body moving in a circular path is directed away from the centre around which the body is moving). This motion was coupled into a valve which then reduced the flow of steam through the engine, slowing it down. Conversely, if the engine was running too slowly, the balls would drop, the valves would open and the engine would speed up. In this way, Watt was able to stabilise the output of his engine around a constant speed. In doing so he had had come up with an early example of what we would now call feedback control. The new experiment focuses on an ultra-small electronics device known as the single-electron transistor , which may one day form the basis of extremely efficient, miniature electronics . These single-electron transistors are somewhat like ordinary transistors, which switch electronic signals, but taken to the extreme limit of miniaturisation such that electrons move through them one at a time. This happens via quantum tunneling, which means the current through a single-electron transistor suffers from the randomness of shot noise. Using sensitive charge measurements, the researchers were able to detect exactly when an electron had tunnelled through the transistor. Based on this electron counting, they then adjusted the voltages of the transistor, following Watt’s recipe for the centrifugal governor: if more electrons than normal had tunnelled, they changed the voltages to reduce the flow; if fewer had tunnelled, the voltages were changed to increase the flow. In this way, they were able to show that, after a certain time had elapsed, the total number of electrons to have tunnelled through the device could be controlled precisely, with the results being almost entirely free of the randomness of the noisy tunnelling process. The technique may not make it into your consumer electronics any time soon. The research was carried out at low temperature on a single device so we’d first need to make it work at room temperature and scale up the function. Nevertheless, it does represent an important breakthrough, as it reports the first application of feedback control in electronics that acts at the level of the individual electron. The results are especially important for the development of future quantum technologies , which look to harness the peculiarities of quantum physics to make devices that vastly outperform our current best. Such machines could be a huge boost in areas including secure communication, code-breaking, precision measurement and quantitative analysis of “big data”. Quantum technologies however require an exquisite degree of control and, as this research shows, tried-and-true feedback techniques with their roots in the steam age may still have an important role to play.